Last weekend I went out to the theatre to see a movie. It had been a month and a half since I’d had the pleasure of fold down chairs, loud chewers, and the smell of stale popcorn. My friend and I showed up without having decided what we were going to see as it was a toss up between Green Book and Glass. Green book because it was an Oscar nominee and received good reviews both critically and commercially. This was my friend’s first choice. 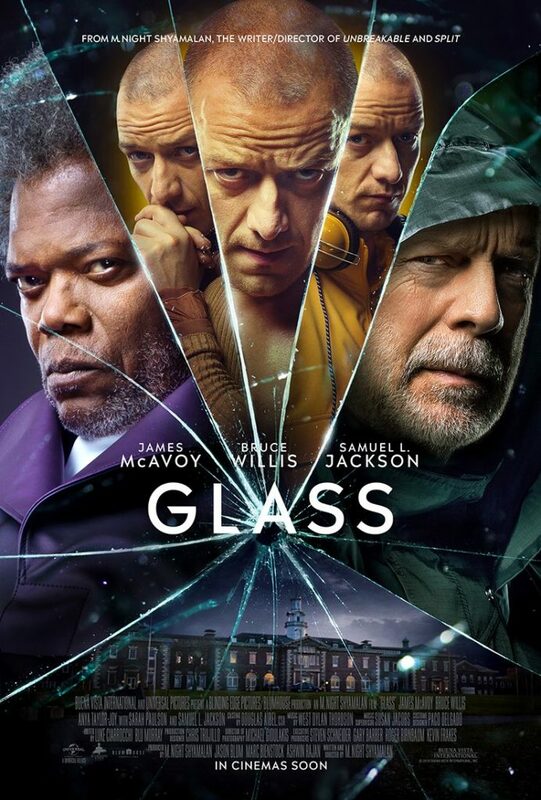 Glass because it just came out, we both liked Split and were interested to see where it was going. This was my choice. We chose latter as it was starting 10 minutes before the former. 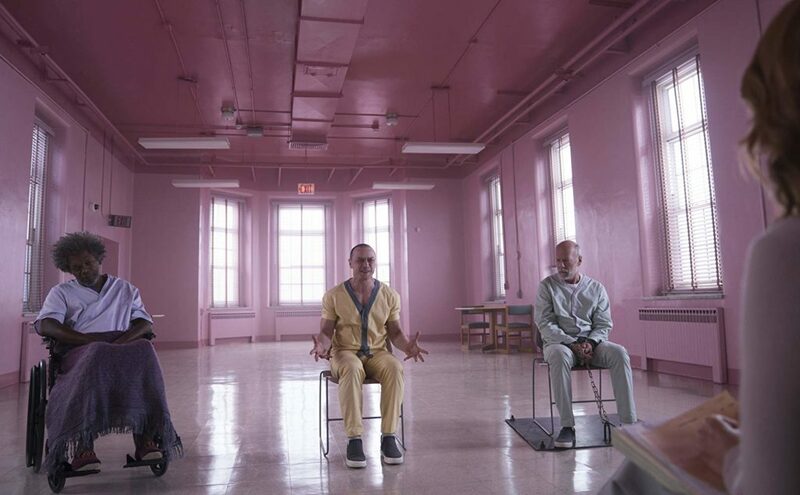 Glass, directed by M. Night Shyamalan, is the sequel to the unexpectedly good Split which turned out to have a surprise connection to the 2000 movie Unbreakable. They brought back almost all the players from those 2 movies including Bruce Willis as David Dunn, James McAvoy as Keven Crumb and all his various personalities, Samuel L Jackson as Elijah Price or as he now prefers to be called Mr Glass, Spence Treat Clark as Joseph Dunn, Charlayne Woodard as Mrs Price, and Anya Taylor-Joy as Casey Cooke. And introduced a new character with Sarah Paulson as Dr Ellie Staple. The opening of the film is pretty great. You catch up with Crumb as the Horde has kidnapped and is terrifying another group of girls. This allows for an uncomfortable and disturbing reintroduction to the dominant personalities utilising this one vessel. You also find out that Dunn has continued embodying his superhero persona as he stays in the shadows doling out vigilante justice to those he deems worthy. You quickly find out his son has grown up, their dynamic has changed, and he has been helping him with his task of stopping crime in the city. Crumb and Dunn soon meet leading to a rescue of the girls and The Beast being unleashed. A short intense fight ensues that is abruptly ended when they are surround and captured by the police and handed over to Dr Staple. They are each imprisoned in a cell that suppresses their “power”. Crumb’s has powerful lights that flash in a sequence that triggers a switch in his personalities where as Dunn is blasted with jets of high powered water. We also soon find out that Elijah Price is also being kept in the facility, highly sedated, to suppress his genius. And that is when the movie goes down hill. This has been a problem for SHamalayn since… well… Unbreakable. He builds these interesting worlds and these characters that you want to know more about but as soon as the introductions are over the story plummets into a pit of boring exposition. As he made more and more movies this point got earlier and earlier in the story. Leaving more time for the audience to exhale long sighs and confused/bewildered mutterings of “what?”. Dr Staple is the character burdened with unloading most of the exposition as she does not stop talking but actually does very little. That would be fine if what she was saying was interesting but I just felt like they were actively trying to put the audience asleep. And to tell you the truth her consistent monotone and evenly paced delivery may have been purposeful. As a psychiatrist she is meant to sooth and lull people into a comfortable place. But you don’t feel lulled or soothed or comfortable you feel bored, agitated, and simply unimpressed. In juxtaposition, James McAvoy’s portrayal of all the Personalities inhabiting Mr Crumb is fantastic. The personalities are distinct, some extreme, and really funny at times. He doesn’t just change his voice but also posture and mannerisms in, literally, a flash. At points you can tell which persona is being portrayed by his stance or a small movement even before they speak. His scenes are quite mesmerising to watch. Everyone else in the movie was just…fine. They did their job. They emoted to an appropriate level, moved the story forward, and portrayed the character in a believable way. There is nothing to really complain about but there is nothing that stands out either. 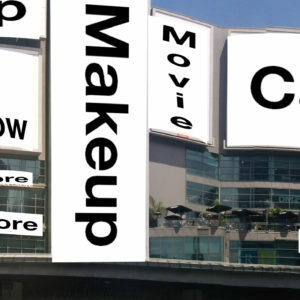 The movie tries its best to keep the audience’s interest by inserting highly orchestrated bits of cinematography and set design. These scenes come at times of “revelation” but come across as jarring and extraneous. Despite its almost garish tone, the pink is the only thing that doesn’t bother me about that scene. It seems some research was done when picking the colour because I believe it is Baker-Miller Pink aka Drunk-Tank Pink. It is a colour that has been claimed to reduce hostile, violent, or aggressive behaviour. With these 3 in the room it would be necessary to take as many precautions as possible. But again it is a dramatic setting with a whole lot of exposition that is quite boring. The movie is also predictable which added to the boredom. My friend and I had been discussing the movies before hand and had the first 2/3 of the movie correctly figured out before we even stepped into the theatre. And out of that last 1/3, about 2/3 of that was predictable based on what happened in the film. And the last 1/3 of the 1/3 of the 1/3 (so 1/9? I think I did that math right) was classic Shyamalan aka “The Twist”. Shyamalan seems to be setting up some sort of cinematic universe a la Marvel, a Shyamalan Cinematic universe (SCU) if you will, where he can continue to tell his type of “superhero” stories. Apparently there is a secret society out to discredit and snuff out real superheros and based on some of the info disseminated there are other people like Dunn, Crumb, and Price out in the world that need to be found and eliminated. This group has been around for some time, it is not clear how long, but at least 100 years. They have kept the idea of superheroes as myth or fiction by diluting and/or destroying any evidence of the person’s existence including the person. Until now…dun. dun. dunnnnn! The thing is, this would have actually been brow-raising if what came before it had bothered to keep my interest. If my SCU theory is correct, they will be trying to release more films in the same world and reusing some of the characters. 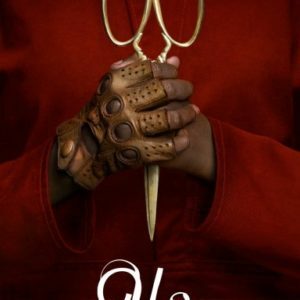 And I gotta say, based on this film and many of its predecessors, I don’t have a want to see anything else that Shyamalan has come up with. It will most likely be a convoluted, boring, disappointment. As the film ended and the credit began to roll, I leaned over to my friend and simply said, “I’m sorry.” He laughed. We walked out of the theatre with the rest of the audience in relative silence. As I passed through the doors an older woman was sitting with, i presume, her husband and with a smile asked me if I liked it. I couldn’t say no as it was clear she was going to be on her way in to see the film and I definitely could not say yes. I shrugged at first and said it was ok.
She looked at me a little deflated but pleasantly told me she looked forward to watching this as it portrayed someone like her and was thoroughly thrilled by the previous films. She had special blood, Type W I think she said, and there was only like 34 people in Canada that had it. It made her immune to diseases and she never broke anything or got sick. Her husband muttered beside her “its true”. I guess she was relating to Dunn not Crumb thankfully. I nodded and smiled and told her she would enjoy the film then if that is what she was there for and moved along. If you want to see Glass because you feel represented, you go right ahead. If you want to see the film because you saw Split, liked it, and want to see where it goes…I guess you could check it out but you really don’t have to (most of it is in the trailers, you’re good). If you are going to go see this because you want to have a good time at the theatre then nope, you definitely picked the wrong movie. The film isn’t bad, it is just above mediocre and that is only because McAvoy was able to elevate the film with his excellent portrayal but it wasn’t enough to break through the Glass…See what i did there?